Our Maccabi kids are our sporting future and we want them to have fun and be active when they are at our Maccabi grounds. With generous support from Harry Gunzburg and the Adonis and Bensusan families we are building a fabulous Playground. We are endeavouring to upgrade this whole area by adding plenty of seating, shade cover and other fun equipment to make this area comfortable and appealing for all our community. We invite all our community to be part of this project and make a tax deductible ASF donation. The donation can be in honour of a family member you loved sitting at the playground with, or for a little one who will rush over to play on this equipment - either way your family's name will be honoured by having a Golden Brick in their name. Donations start from $150 for an Individual Golden Brick, $300 or $500 for a Family Golden Brick, and $1200 for a commemorative plaque on a playground bench seat. 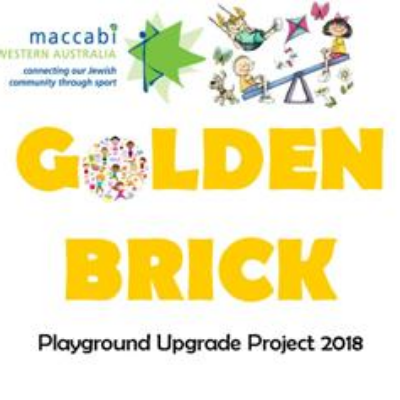 Any other donation amount will be put towards shading and other playground equipment and will be recognised with a plaque on our Maccabi Wall of Fame. Sports Memorabilia and Awards Project: Raising money to collect and display memorabilia relating to WA Maccabi's sporting history. A fantastic initiative by Maccabi! Well done to all involved. Thanking all the WA community for their support in this fabulous fund raising initiative!! Thank you Maccabi for all that you do and continue to do for our community. Help them to spend less time on their screens. A great initiative. Good luck.